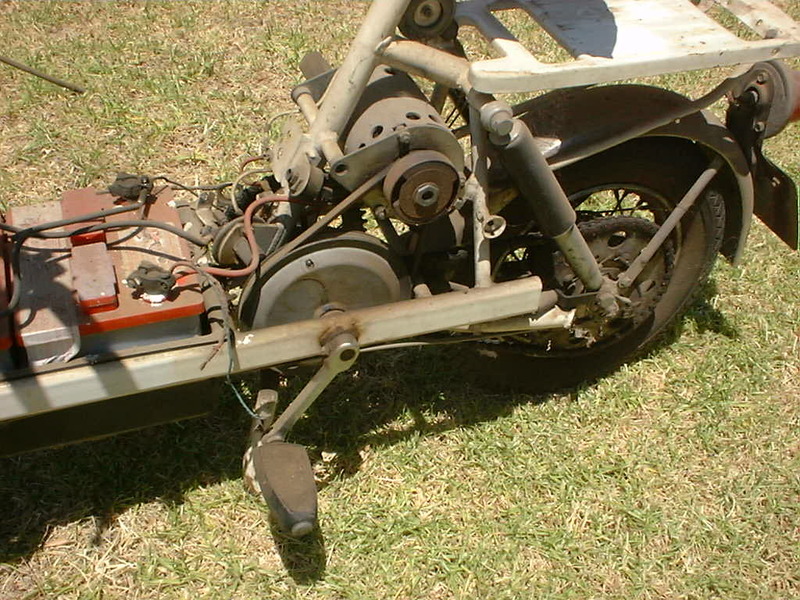 These are the before shots of my Solo Electric motor scooter. My father was given it by his uncle who won it on a television quiz show in the 1970s. My father rode it for several years as he went visiting his parish. 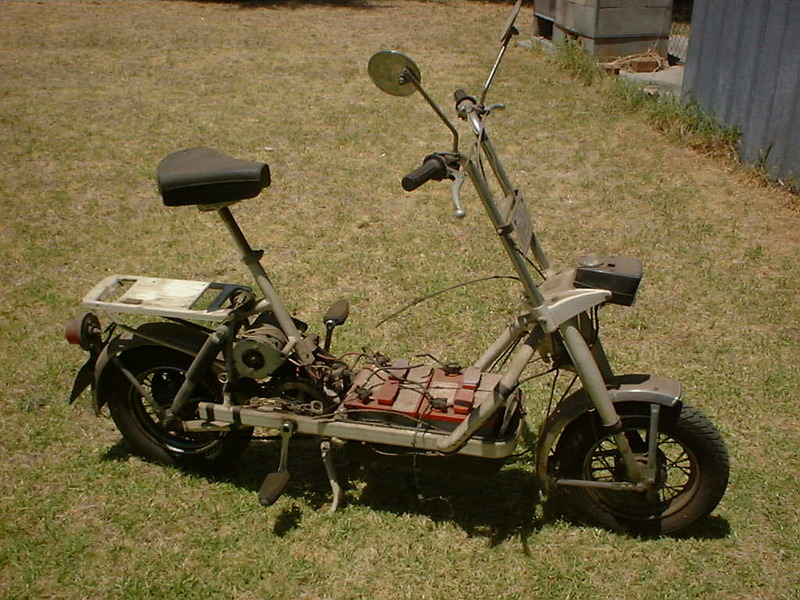 I overhauled it in the 1980s after it had fallen into disuse and disrepair. One of the magnets in the motor had come unstuck and the batteries were dead. I rode the scooter to school until the charging plug shorted out. I couldn't afford to fix the damage at the time so once again the scooter was forgotten about. Discovering the community of the Electric Vehicle Discussion List has given me the inspiration to get the old cycle running again. It will serve good purpose as a run-about in the city for the company I work at. I have included some photos which can best be described as 'before'. I will upload pictures as I go. There is a smart red cover not shown here with the words SoloElectra printed on the side. Note the centrifugal clutch and the motor speed controller, i.e. the big cable operated switch. This cable died in the short circuit. These are not the original batteries. 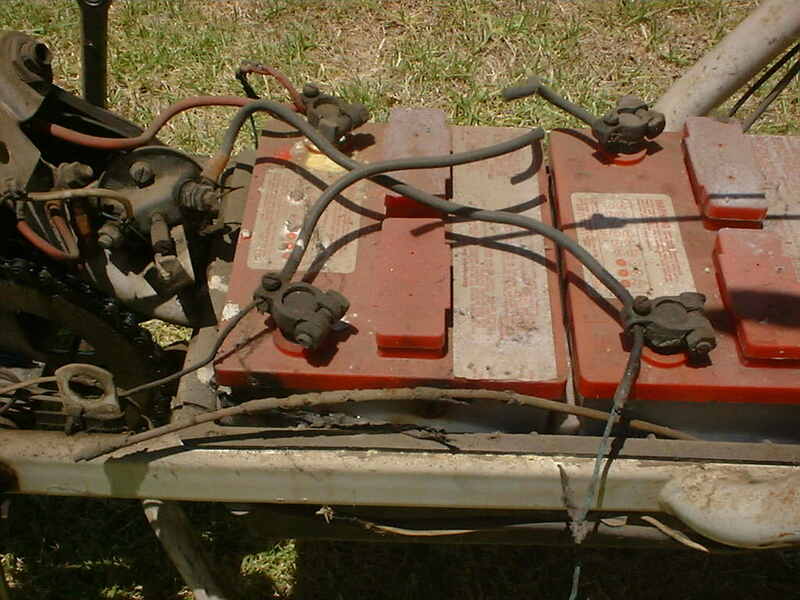 These batteries are designed to fit a Porche motor car and have a slightly lower capacity than the originals. I hope that almost 30 years after the cycle was made I can find batteries of similar capacity to the originals. The charred cable in front is what is left of the throttle cable. The cut cable between the packs is what stopped the electrical fire after the charging cables shorted and caught fire. You can see the 'big switch' clearly here to the left. The horn and brake light were added in Australia to make the cycle street legal. I am going to find out this week what 'street legal' means in 2001 compare to 1974 when the cycle was first registered.